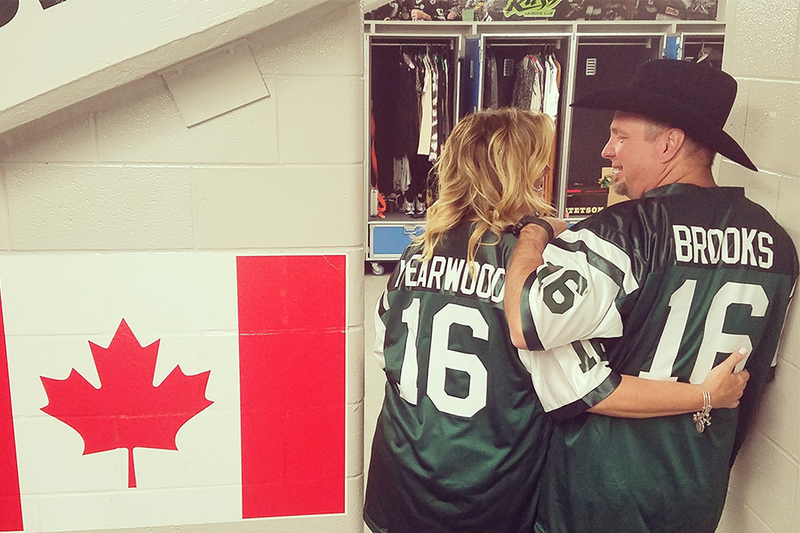 Garth Brooks and Trisha Yearwood before Brooks' first of six shows in Saskatoon. The two were given custom Huskies jerseys at a press conference on Thursday (photo courtesy of Brooks' Twitter). Call it a home-and-home between Garth Brooks and U of S Chancellor Blaine Favel. The two first met in 1996, when Brooks played a concert in Saskatoon. Favel, serving as grand chief of the Federation of Saskatchewan Indian Nations at the time, presented the country star with a buffalo sculpture. Their experience came full circle yesterday when Favel had the opportunity to present Brooks and wife Trisha Yearwood with personalized U of S Huskie jerseys—apparel they donned in a pre-concert snapshot posted to Brooks’ social media accounts.